RW-40-9.5 is R core audio output transformer for single ended type amplifier. Excellent magnetic properties of R core as well as precisely wound construction of the coil by the computerized manufacturing system achieve the wide bandwidth, low distortion, and low magnetic loss of the transformer. Power handling capacity 40W, primary impedance 5,000 ohms or 9,500ohms, equipped with ultra-linear taps and cathode feedback winding, the best match for single ended tube amplifier using 211,845, GM70, etc. Push-pull connection is also available. 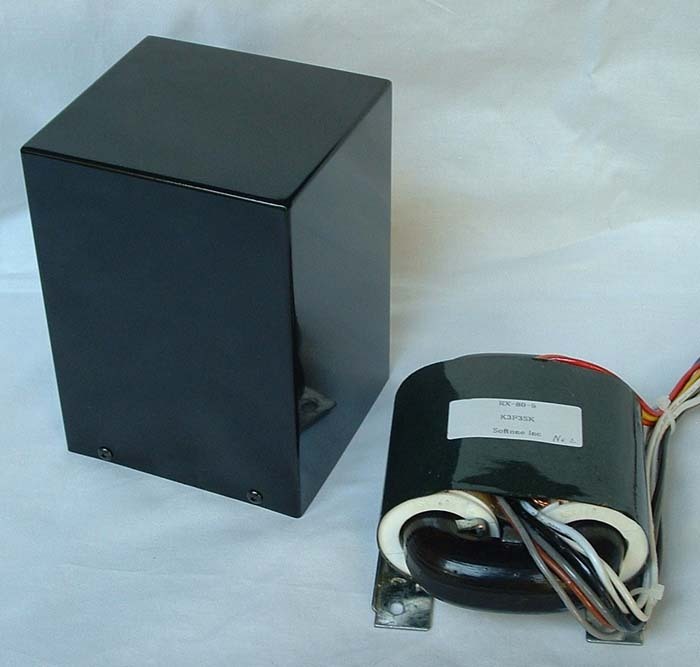 You can use this transformer as constant inductance type push-pull output transformer. With RW-40-9.5, you can build a maintenance-free push-pull amplifier. The table below describes the selection of load impedance and the relation of the phase between the primary and secondary and 3rd. You can select non-inverted connection between the primary and secondary and 3rd for two-stage amplifier and inverted connection for three-stage amplifier. When the load is selected to 9,500 ohms, two taps for UL are available; its feedback factor is 50% or 25%. The higher factor makes the plate resistance and distortion lower, however, the sensibility and output power will be reduced. When using the cathode feedback winding, the connection of primary winding and cathode feedback winding is as follows. There are two cathode feedback windings in RW-40-9.5. The cathode feedback ratio can be selected by two windings being used in parallel or in series. The cathode feedback ratio decreases if it uses in parallel. The cathode feedback ratio increases if it uses in series. In addition, a different wire connection adjusts to RW-40-9.5 by the Non-inverted or the Inverted. The table below shows the connection of each situation. It explains here as 9.5K Primary and in parallel cathode feedback winding. The gain and ratio for 5K Primary and in series cathode feedback winding is described in the last table. The load impedance of the output tube is not 9.5K ohms. The frequency characteristic of the audio output transformer varies with the signal source impedance that drives the transformer. The primary coil of RW-40-9.5 is perfectly symmetrical the center of which is set at red lead wire. This construction enables RW-40-9.5 to be used as constant inductance type push-pull output transformer, fairly suitable to build a DC unbalance current proof, maintenance-free type push-pull amplifier. The table below describes the connections and specifications as constant inductance type push-pull output transformer. When using the cathode feedback winding, the connection of primary winding and cathode feedback winding is as follows. In the case of self-bias, a self-bias resistance and a bypass capacitor are connected between K1-Brown and a ground and between K2+ white and a ground. The load impedance of the output tube is not 2.38K ohms of a usual pp circuit (1/4 of 9.5K ohms).